Today's oh-so-simple but still sumptuous tomato recipe: Perfectly ripe summer tomatoes marinated in gentle vinegar and good olive oil with slivers of onion and fresh herbs. Yeah that's it but is it ever heavenly! Weight Watchers Friendly, WW PointsPlus 2. Low Cal. Low Carb. Gluten Free. Paleo. Not just vegan, "Vegan Done Real". Tis a happy day, the day the first tomato ripens. We sit in the shade to share the first one like an apple: better one tomato than two, somehow, for this heady moment. The flesh is already warm from the morning sun, tomato juices run down our chins. We grin: summer has arrived! Soon we'll be doing all the things gardeners do with what will soon become a glut of tomatoes – a summer-only tomato soup, the Italian bread salad, even making homemade mayonnaise just for BLTs. But this very first tomato? It's always the best of the summer. Once or twice a week for the rest of the tomato season, the evening meal will include either Marinated Tomatoes or a cousin salad with both cucumbers and tomatoes. It's hardly a "recipe" – call it a "concept" or better yet, just a reminder to revel in a summer tomato at least once this year. 2 tablespoons good vinegar - white wine, red wine, sherry, rice, etc. Fresh herbs, snipped - chives, basil, mint, etc. Soak onion slivers in ice water while making the rest of the salad, this removes some of their sharpness. Drain the slivers on paper towels before adding to the salad. Cut tomatoes into wedges, about six or eight wedges per tomato, drop into a bowl. Splash with vinegar and olive oil, sprinkle with sugar, fresh herbs and salt and pepper. Gently stir, just a bit, you don't want to mash the delicate tomatoes. Let rest for about 45 minutes, gently stirring every 15 minutes, adding the onion slivers during one of the first stirs. Serve and do enjoy, this is summer food at its very best! A mix of tomato colors makes for something extra-pretty! 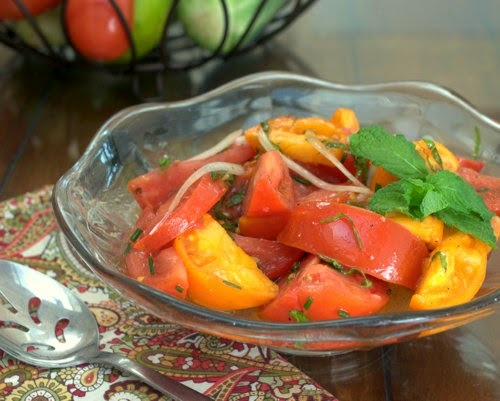 The tomatoes get too soft and mushy if marinated for more than an hour. For a good make-ahead Marinated Tomatoes, use good cherry tomatoes – you'll want ones from a CSA or farmers market, grocery store cherry and grape tomatoes have a welcome place in the kitchen but just aren't ripe enough or tender enough or tasty enough for this salad. Is there a way to pin from here? I love this recipe but I'll lose track of it in a heartbeat if I don't pin it. I use Pinterest as my cookbook! Karen ~ There sure is! If you hover your mouse over the image, a “pin” button will appear. Click it to be pin the recipe. And hmm, I’m just realizing I haven’t tested this on my phone, not sure how it works there if that’s what you’re using. MY BAD. Thanks for asking! We do a salad of sliced tomatoes, sliced cucumbers, thinly sliced onion, and pitted kalamata olives. We dress it with a light garlicky lemony oregano and black pepper spiked vinegarette and top it all off with feta -- delicious the day it is made and better the longer it ages. Then when it is almost eaten up, I use the last of the leftovers to toss with rotini pasta as a final-hurrah pasta salad or toss it with couscous or bulgar wheat or steel cut oats. Delicious. The epitome of all things Summer. We eat this salad almost every day after the tomatoes and cucumbers come in either in our garden or the local farmers market. We eat it until we just can't stand the sight of it anymore. Then we set to canning tomatoes and tomato products (I am so in love with tomato jams right now) and pickling the cucumbers. From one foodie to another - Thanks for doing what you do! I have been following your blogs for several years and I always enjoy seeing what you are cooking up next. Andrea ~ Thank you so much for writing, your kind words mean the world! This is similar to a dish I make (can't remember where I got the recipe), except you peel and dice the tomatoes, let them marinate several hours at room temperature, and serve them over spaghetti. I called it spaghetti with summertime sauce. I don't remember what the original recipe was called. GreenGrannie ~ Oh how interesting! And isn’t just so cool how many ways there are to enjoy tomatoes. I’m chomping at the bit for our garden to start producing, we got two a couple of weeks ago, since then ... nothing! Thanks for writing, always.